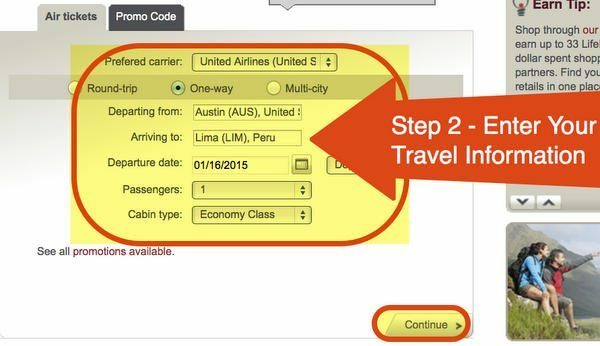 You say, ‘Avianca miles can be used on any Star Alliance airline, like United Airlines.’ How is that done? Can those miles be transferred to United Airline’s MileagePlus? Jonnie wants to know how to use Avianca miles on United Airlines. And if they can be transferred to her United Airlines account. Jonnie can use Avianca miles on United Airlines by redeeming them on the Avianca website or by calling Avianca. That’s because Avianca and United are both members of the Star Alliance. But Jonnie can NOT transfer Avianca miles to her United Airlines account. Because she has Avianca miles, she has to book her flights through the Avianca website or call center (even if they are on OTHER airlines, like United Airlines). Jonnie can book a 1-way flight within the US on United Airlines using 12,500 Avianca miles. 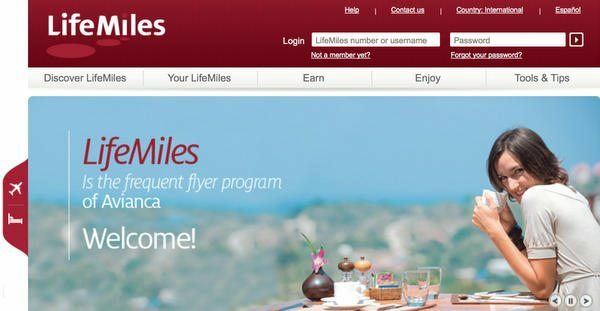 LifeMiles is the frequent flyer program for Avianca, a member of the Star Alliance. Jonnie can use Avianca miles on any Star Alliance airline, like United Airlines. Although she can search for award tickets online, if her itinerary is complicated it might not show up in an online search. If Jonnie applied for the Avianca card with the 20,000 Avianca miles sign-up bonus, she could fly 1-way to Peru on United Airlines for 20,000 Avianca miles. Jonnie should book her award ticket online instead of calling Avianca at 800-284-2622, because their call center doesn’t have the best customer experience. Jonnie has to be a LifeMiles member to search for award seats using the LifeMiles website. Jonnie logs into her LifeMiles account. 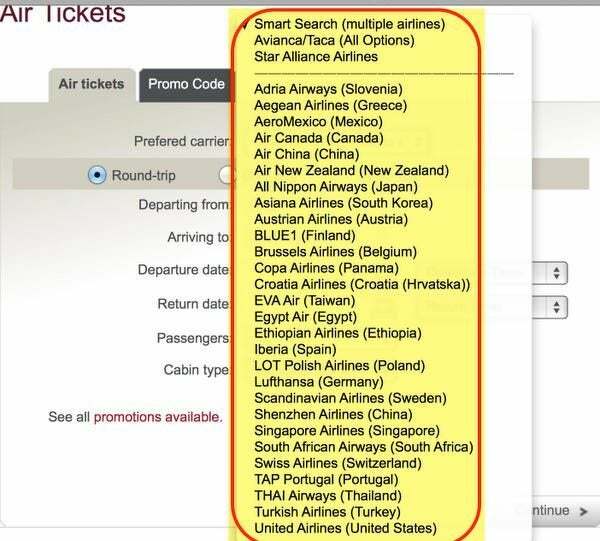 Jonnie can leave the “Preferred carrier” drop down box on the default setting of “Smart Search” to search all Star Alliance member airlines. Or she can choose to search by specific airline, such as United Airlines. Because she wants to fly on United Airlines, she chooses United Airlines as her “Preferred carrier” and enters her travel information. 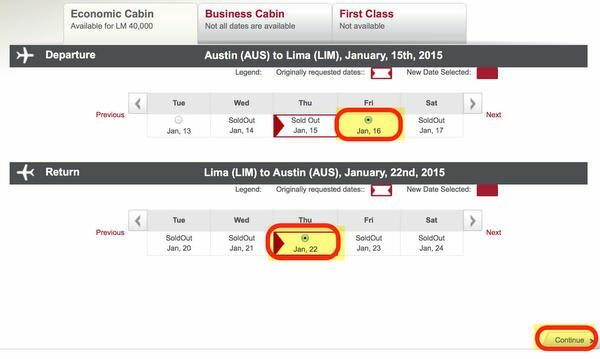 Jonnie is flying 1-way in coach from Austin to Lima, Peru on January 16, 2015. If Jonnie were flying round-trip or doing a “Smart Search,” she might have other choices. 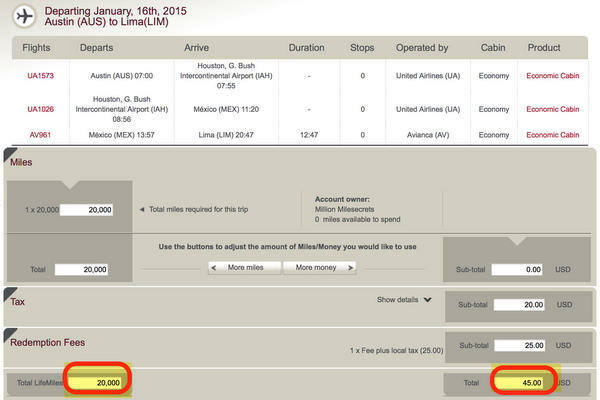 A 1-way flight from Austin to Lima, Peru will cost Jonnie 20,000 Avianca miles and $45. If Jonnie didn’t have enough Avianca miles, she could choose to pay with miles and money. She can reduce the number of Avianca miles she needs by 1,000 mile increments and pay a portion in cash. But the cash rate is not a fixed rate. The more miles you buy, the lower the cost per purchased mile. Essentially you’re getting a discount for buying more miles. Jonnie can buy up to 60% of the Avianca miles she needs for an award ticket. So if Jonnie wanted to save half her Avianca miles she could use Miles and Money. Jonnie will use 10,000 Avianca miles and $150 cash for her 1-way flight from Austin to Lima, Peru. Avianca doesn’t charge fuel surcharges on award tickets so Jonnie can spend a little more money. However, they charge a $25 ticketing fee per person. 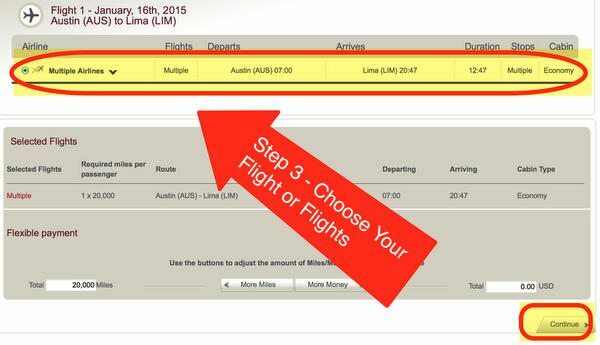 The charge for redemption of an Award Ticket through www.lifemiles.com with Star Alliance Airlines is USD 25 + local taxes. Redemption of Award Tickets in other channels shall be subject to a redemption charge depending on the selected route, time in advance of the flight and elite level of the redeeming Member. Jonnie can use Avianca miles to book an award ticket on Star Alliance airlines, like United Airlines. But she can NOT transfer her Avianca miles to her United Airlines account. Jonnie can book her award ticket on the Avianca LifeMiles website. She can book 1-way tickets, but she can NOT book a mixed cabin ticket. And Avianca doesn’t charge fuel surcharges on award tickets. 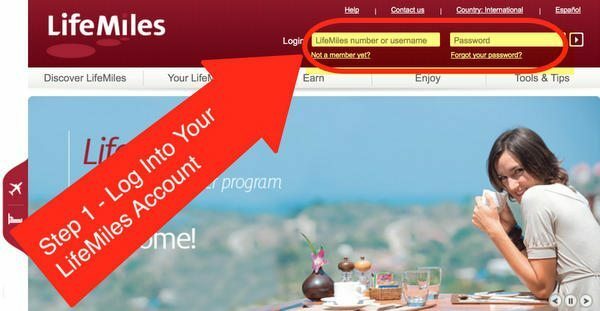 Avianca frequently runs buy miles promotions, so it could be worth it to get the Avianca card for the 20,000 Avianca miles sign-up bonus. Note: Avianca is also known for changing their award program without notice. So you should NOT sign-up for the card or buy Avianca miles unless you plan on redeeming them soon. Husband and I received a $250 Avianca voucher due to an 8 hour delay, I do not have Avianca miles. Can I use the voucher using your directions for award flight? Just for fun, after a “transfer” on the phone, I listened to the ringing for 25 minutes…..yes, 25. I was sure it would eventually just drop the call. I finally gave up. 25 minutes. This is not the only interaction I have had. they are the worst. Lifemiles has almost NO FLIGHTS avaialble for 6 months. And there customer service is the worst. I am in the middle of a transfer now, 5 minutes of ringing. I wish I had never used them. 130,000 points I can use. What is the best way to get either my ticket # or a valid record locator based on my booking? I booked a partner award on Brussels airline which doesn’t seem to recognize the locator Avianca has given me. Is this something the phone agents can actually provide? Or is there some other means of obtaining ticket number or proper locator ID? Thanks! US Bank made a Lifemiles account for me without telling me the password. I was on hold for over an hour with the Lifemiles Dept and no one ever picked up! If you’re not booking an award, it’s best to email. Plus the CSRs are generally hard to understand (and I live in San Diego)! PSA: The 20k offer occasionally goes up to 40k. @Aaron – Not any more.